Based on interactions with various stakeholders we updated several figures on March 25th. Reduce consumption by households and save 20bcm of natural gas. European Union leaders meeting last night in Brussels explicitly envisaged future trade, energy and financial sanctions against Russia in case of an escalation of the Ukraine situation (see the cost of escalating sanctions in our interactive map and how to replace Russian gas in our interactive chart). But for the time being a stronger reaction to the Russian annexation of Crimea has been put on hold in favour of new names added to Monday’s travel black list. There are four reasons for this. First, EU leaders might have feared an unmanageable escalation. Martin Schultz and others talked about the risk of a war. Second, it takes longer to coordinate tough sanctions. The Financial Times points out that not enough work has so far been done to assess the impact that such sanctions could have on the European economy. Third, sanctions might push the Russian economy over a cliff, with potential spill-overs on the fragile global economy. And finally, Europe might find the price of tougher sanctions (and the possible retaliation) too high for the expected political benefits. This in particular relates to the energy trade. While it appears straightforward that oil imports from Russia can be replaced from the global market, there is a serious concern that Europe is too dependent on Russian natural gas. To assess if Russian gas can be replaced we have to answer three questions. 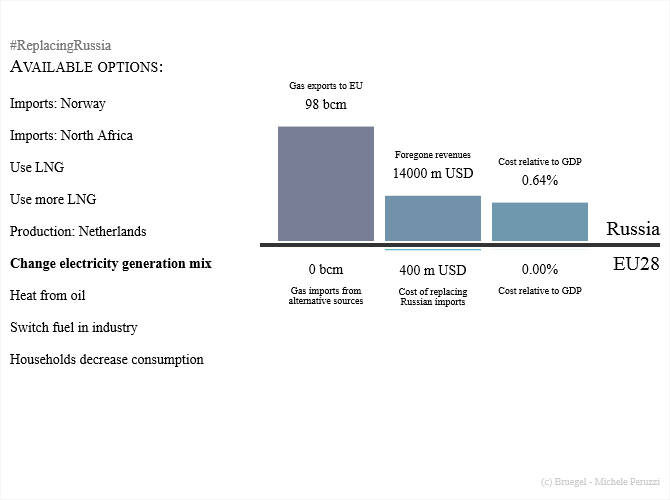 First, how can the total volume of Russian gas – about 130 billion cubic metres (bcm) in 2013 – be replaced? Second, would the alternative supply be available at the right time? EU natural gas consumption is up to three times higher in the coldest winter months than in the summer. Third, can Europe get the alternative supply to where it is consumed? For example, because of the lack of alternative infrastructure, virtually all gas consumed in the Baltics comes from Russia. The second and third questions are very relevant for the central and eastern European countries that currently depend mostly on Russia. In principle, two technical solutions, which would require substantial engineering, legal and commercial preparation, could be (1) replacing gas consumption in district heating systems by fuel oil and (2) filling the large west-Ukrainian storages (up to 30 bcm) with western European gas during summer. If properly implemented these measures could alleviate the dependence on Russian gas in the region and in winter substantially. Regional demand reduction and optimising the infrastructure (and its usage) to enable more inflows from alternative gas sources can also be considered, but we will not look at them in depth here. We want to focus on the question of whether 130 bcm of Russian gas per year can be replaced within the coming year (in the longer term, investments in alternative energy sources could make redundant any import dependency), and what the cost of the alternative supply might be. Note: the author’s estimates are intended as an approximate guide only. There are essentially three ways of replacing Russian gas: (1) alternative natural gas supplies (eg, Norway), (2) switching energy consumption for natural gas to other fuels (eg, coal) and (3) reducing gas consumption – see the table. Europe in 2013 received natural gas from Russia (27%), Norway (23%), North Africa (8%), as liquefied natural gas (LNG) from other suppliers (9%) and domestic production (33%). Increasing pipeline imports from Norway (102 bcm in 2013) is possible up to about 120-130 bcm. There is certainly spare capacity for importing more in the summer months to fill the European gas storages. Increasing natural gas imports from North Africa by at least 5 bcm also seems feasible. The cost of this gas might be slightly higher than Russian gas (US$350/tcm). Most importantly, however, LNG import capacities were underused in 2013. There is about 180 bcm/year of existing re-gasification capacity in the European Union, plus an additional 35 bcm under construction. But only 46 bcm was used in 2013 (versus 65 bcm used in 2012). The question here is where the LNG tankers should come from. Certainly there are some spare capacities that could be rerouted to Europe for modest price premia. If we could really get additional 30 bcm at above $500/tcm is hard to tell. If we are competing with Asian prices (US$710/tcm), however, significant amounts of gas can be attracted to Europe, which is closer to the LNG production centres in Africa, the Middle East and South America. Finally, even though over five years, natural gas consumption in Europe is set to decline, in the short term opportunities for stepping up domestic production exist. In 2013, the largest natural gas field in Europe – the Dutch Groningen field – for example produced significantly less gas than it is able to deliver. Production was restricted to 43 bcm, but temporarily up to 60 bcm seems feasible. There is still some 60-80 bcm of gas used for generating electricity. About half of this might be produced from other sources. Obviously, a full switch might not be possible because some of the gas-fired power plants might be pivotal for meeting peak demand in some import-constrained countries such as Italy. As discussed earlier, district heating systems could switch from natural gas to fuel oil. Up to 10 bcm of corresponding natural gas consumption might be replaced this way. Obviously oil is much more expensive. The current crude oil price is equivalent to about US$750/tcm. Finally, also industry might switch away from using gas. If 10 percent of industrial gas consumption (150 bcm) can be switched to coal, electricity or oil, another 15 bcm of gas can be replaced in the short term. Most of the natural gas consumed in 2013 was for residential and commercial heating and industry. Some of the gas-intensive industries produce products that are traded on the global market and are quite abundant at the moment (steel, aluminium). As a last resort, curtailing consumption in some of these industries will have limited knock-down effects. Again less costly, reducing ambient temperature by 1.5 °C during heating season (or similar energy efficiency measures at the residential level) would reduce corresponding natural gas consumption by about 10 percent, or 20 bcm. Replacing 130 bcm of natural gas imports from Russia within a year would be a significant challenge, but, as our rough estimates show, not impossible. The economic impact would be significantly less than that of the 1970s oil crisis, and the impact on Russia would be more severe than the impact on the EU. The cost of dealing with a Russian gas supply disruption will largely depend on how Europe coordinates its response. Continuing to burn about 1 billion cubic meters of natural gas in pulp and paper production in Spain or France while people are freezing in Slovakia would quickly undermine the support for a joint European stance in the face of the Russian annexation of the Crimea. European leaders should use the crisis to make the internal energy market work. Bruegel’s commitment to the quality of its work is equal to its commitment to be timely. If, in our effort to be timely, we have made an error in a calculation, please let us know in the comments below and we will make efforts to correct it.